To walk from Ilfracombe to Lee is a particularly rewarding experience, especially when the weather is fine and visibility good. The distance involved is approximately 3 miles and although the walk can be covered within an hour, it is better to allow ample time for numerous stops, as the panoramic views encountered are worth more than a casual glance. Please note. Before undertaking a walk to Lee, be aware that local bus services are virtually non-existent. However, there is currently a limited bus service from Ilfracombe running two days a week (Tuesday & Fridays) Please refer to the Bus Service table else ware on this site. Commence the walk from the War Memorial in llfracombe, ascend Church Hill and pass the Parish Church Lych Gate. Carry on straight ahead with the church boundary wall on your right. The road bends to the left into Langleigh Road. Continue to the end until it intersects Broad Park Avenue. At this point bear to the right and continue for 80 yards. Leaving the main road, turn left into the secondary road (indicates by an arrow on the Langleigh Farmhouse Hotel sign) Walking along this road, which has been widened in past years to service a growing estate. One will find after a short distance, the original lane on the right hand side, take this short lane and at the end turn sharp right and pass the entrance of Langleigh Cottage. The walker will then confronted with a steady climb, initially on a surfaced road and then straight on to an almost un- maintained surface. Eventually a five bar gate will be reached which signifies the beginning of the National Trust land. Continue on the track, initially across open meadow. The path then begins to climb again, a finger post on the right will be reached, indicating Coast Path and Lee. Soon the highest point is reached and the walker can then enjoy a steady decent from there on. From this high point, it is as well to take advantage of a conveniently placed seat. The panoramic views from this point are quite breathtaking. On a clear day, in a Westerly direction Lundy Island will be visible, some 19 miles away. 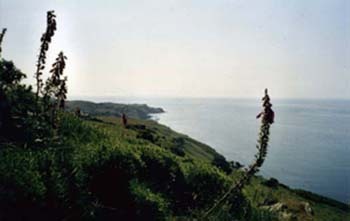 Extensive views of the Welsh Coast can also be seen. The track continues across the Downs, parallel to the field boundaries on the left. Eventually a five bar gate will be reached, which indicates the end of the National Trust boundary. Continue the descent, now in a traditional Devon lane. There are two options of turning left off this lane by way of way marked paths, both of these will bring the walker out in various parts of the village. By continuing straight on the lane eventually emerges at the side of the Lee Bay Hotel. At this point a left turn leads to the Village Center whilst a right turn leads to the Picturesque Bay.